Darryl Lester, 60, and his wife at their Tacoma home. Darryl was lead plaintiff in a 1971 lawsuit that successfully challenged the use of culturally-biased IQ tests to improperly channel California black students into special ed. His pseudonym: Larry P.
In a Bayview school auditorium, African American parents are gathered to share some pizza and talk about special education. Plenty of black families have to navigate that system. Because today, nearly one in three black students in San Francisco Unified schools is in special ed, district data show, compared to one in eight non-black students. Nearly all the black parents in the room tonight have advocated for special ed services for their kids, but none are happy with the system. And there are plenty of tears. What comes along with that is a history of black students perceived as troublemakers, and steered into categories of special ed that don’t fit or meet their needs. Federal law dictates that special ed students get an Individualized Education Program or IEP. It spells out their struggles and the support they’ll get, like one-on-one instruction, extra time on tests, therapy or a one-on-one aide. Even though her son’s paperwork identified his main issue as difficulty understanding directions, this mom shares, he’s been routinely chastised for it. Research has shown that boys are especially likely to be mislabeled and misunderstood for what adults at school perceive as aggression or defiance, but the group’s facilitator, Mauricha Robinson, tells the group that can be true for girls, too. Another mom weeps openly. As a low-income black parent, she says, just trying to be heard around what she thinks her autistic son needs is exhausting. A lot has improved at San Francisco Unified, but to understand these parents’ despair it helps to know some history. It was here in San Francisco that a group of African American students in 1971 challenged the mandated use of IQ tests statewide to disproportionately steer black students into special ed. Dent and his colleagues tried negotiating — with district and state officials — but the talks went nowhere. So at the urging of local civil rights lawyers, they sued. The legal case, Larry P versus California’s then-state superintendent of instruction, is the subject of a lot of academic articles and plenty of debate — to this day. Larry P. was the pseudonym given to the main plaintiff, to protect his privacy. He was one of six black students labeled “Educable Mentally Retarded” who filed suit in federal court against the district and the state. Enrollment in that special ed category peaked statewide in 1968 — at nearly 60,000 students. More than a quarter of students in that special ed category were African American, even though black students made up less than ten percent of the student body. The year before the judge ruled, SFUSD’s ratio was even more extreme: half the kids in that category were African American. The disproportionality was due in part to the fact that, as a group, African American students performed more poorly on IQ tests. The court would eventually conclude those tests were biased toward knowledge the students hadn’t acquired, for cultural reasons and because many got inferior educations at inferior schools. Once they landed in special ed, U.S. District Judge Robert Peckham wrote in his 1979 ruling, they were doomed to fall “farther and farther behind,” because instead of academics, their classes emphasized “personal hygiene and grooming,” “social and emotional adjustment” and “basic home and community living skills.” The district had presented its special ed system as color-blind, but Peckham made it clear: It wasn’t. The category of “Educable Mentally Retarded” went away by the mid-1980s and after some legal wrangling the court lifted the testing ban, but state education officials didn’t. Because of the Larry P case, California still prohibits the use of intelligence testing on Black students — for any kind of special ed placement. It’s the only state that does that. Dr. William Thomas was a young school psychologist during the Larry P. trial and sat in from time to time. Two decades later, he convened a symposium about the case that he turned into a book. Lots of people talk about Larry P, the case. But what about Larry P. the man? No one seemed to know what became of the kids who sued. A visit to William Thomas, another elderly black psychologist, offered a clue. Thomas, who wrote a book about the case, recalled in an interview that Larry P. and his mom had moved to Tacoma, Washington and went public with their real names when they came back to testify in the case. A 1977 newspaper clipping confirms that his true name was Darryl Lester. This 1977 news clipping, which included a courtroom artist's sketch of the young Larry P., revealed that his true name was Darryl Lester and he had moved to Tacoma. He’s easy to find. He’s 60 years old now, still in Tacoma. Until now it turns out, no one has ever asked him to tell his story. The judge had said the whole class of plaintiffs was mistreated, robbed of an education. What kind of scars did they carry? Darryl Lester and his wife, Cecilia, live in a housing project redeveloped not long ago into a neighborhood of two-story townhouses. Their place is homey, covered in family photos, with a plush sectional sofa that takes up much of the living room. He fell behind fast. He says he was “very good in math,” but it turns out, he did have a learning difficulty, a really specific one. He struggled with reading. He never got the help he needed, but he did get teased, he got angry, and he got suspended, a lot. That's common. To this day, black students in special ed — especially boys — are kicked out of the classroom more than just about any other student group. Lester says that when the family moved to public housing in Hunter’s Point — to be close to his new school — his education got even worse. “I walked to school and cried all the way. I just didn't like it. He says, he felt like he wasn’t learning anything. Darryl Lester, 60, talks about his schooling at SFUSD. He was lead plaintiff in a 1971 class-action lawsuit that successfully challenged the use of culturally-biased IQ tests to improperly channel black students into special ed. His pseudonym: Larry P.
There was lots of recess time, and field trips, Lester says, but pretty much no instruction. Lester didn’t know it at the time, but his mom was one of the black parents working to sue the district. He never got any benefit from the suit, though, because the year the case was filed, mom took the boys and moved north to Tacoma. 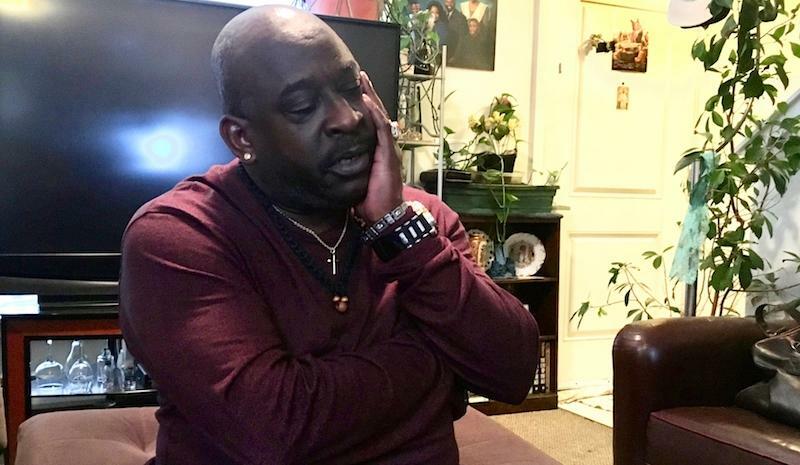 The judge had noted in his ruling that kids placed in dead-end classes fall further and further behind, and that’s what happened to Darryl Lester. Before starting at his new high school, he took placement tests — and failed. That’s when he was told he’d be entering a special ed program again. He was told to report each morning — to Safeway — in order to earn school credits. Lester says he worked for free from 7:30 to 11 a.m. every morning, before attending a few classes in the back of the high school. After a while, his family protested, and the school put him in with the general population. He tried hard. Went to summer school and night school. Even though he walked in his graduation ceremony he later found out he was two credits short of a diploma. Darryl Lester’s just one man, but as Larry P, he represented a huge legal class of California’s black students. There are no doubt many more like him who’ve struggled with dead-end jobs and low self-worth. The damage didn’t end with them. The judge made districts reassess all African American special ed students statewide — without IQ tests — and the numbers dropped a lot. But black kids still wound up in special ed way more than other students. In new categories — of “specific learning disability,” “emotional disturbance,” and more recently, “other health impairment.” That includes ADD and ADHD. Kids who’ve experienced trauma are sometimes misdiagnosed with that — and mistakenly labeled emotionally disturbed, because those categories are more subjective, more susceptible to implicit bias. In 2010, an audit of San Francisco Unified found that black students made up a little over a tenth of the district’s student body, but a fourth of special ed students. That’s the same disproportionality that the judge in the Larry P case had condemned statewide — from 1968. The audit also found that black San Francisco Unified students made up half the students deemed “emotionally disturbed,” and they were much more likely to be placed in segregated schools or classes. Since then, she says, the district’s changed its whole approach: to support more struggling students early on, so they never land in special ed; do deeper assessments that take a child’s whole life story into account; and to try to better tailor services to each special ed student, instead of putting them in cookie cutter programs. There has been progress. 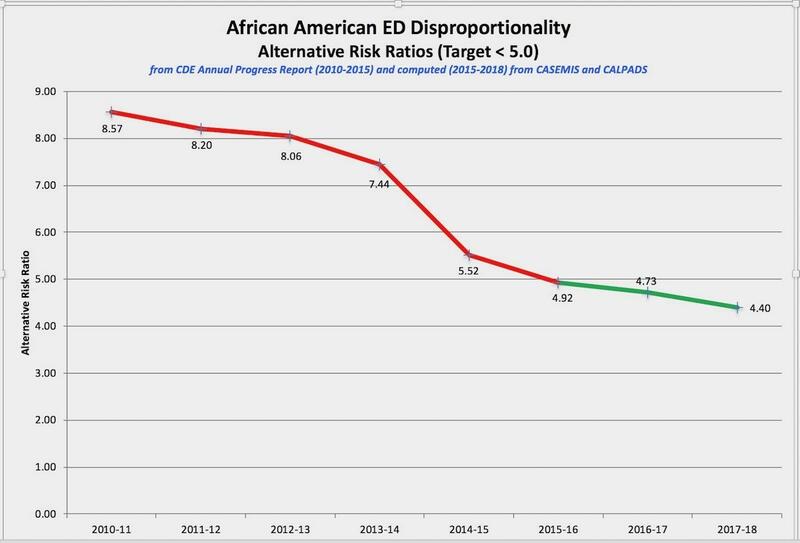 The district’s entire black student population has dropped a lot since that 2010 audit, but the number of black students in special ed has gone down more than twice as much. Back then, black students were eight-and-a-half times more likely than non-black students to be labeled “emotionally disturbed.” That’s down to just under four-and-a-half times more likely. African American special ed students are much less likely to be segregated in special schools today. And the district is pushing towards what’s known as full inclusion — keeping special ed students in regular classes for most of the day. Black students at SFUSD used to be eight-and-a-half time more likely than non-black students to be designated emotionally disturbed. That's dropped significantly. 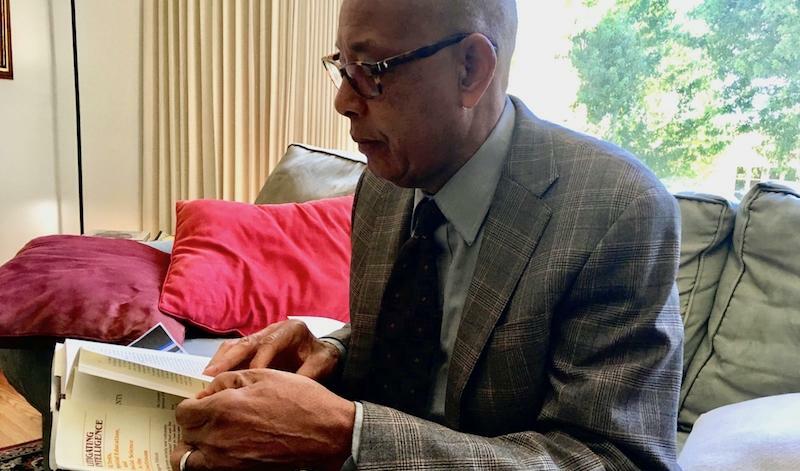 In part because of that, the California Association of School Psychologists is pushing state education officials to lift the ban on intelligence testing for African American students imposed in the Larry P. case. They say that it hasn’t solved the problem of disproportionality and “places school psychologists in the untenable position of being required to perform assessments that are substantively different for students whose skin happens to be black compared to other groups.” Tests and the training of those who administer them have evolved, they say. The Association of Black Psychologists maintains the tests remain biased and should not be used. But disproportionality doesn’t necessarily mean that black students don’t need special education services. Even if a student doesn’t qualify for special ed, Robertson says, the district still needs to provide the kind of support that can help that child do well in school, not just academically but socially and emotionally. That’s the goal. There are some bright spots, where it seems to be working. 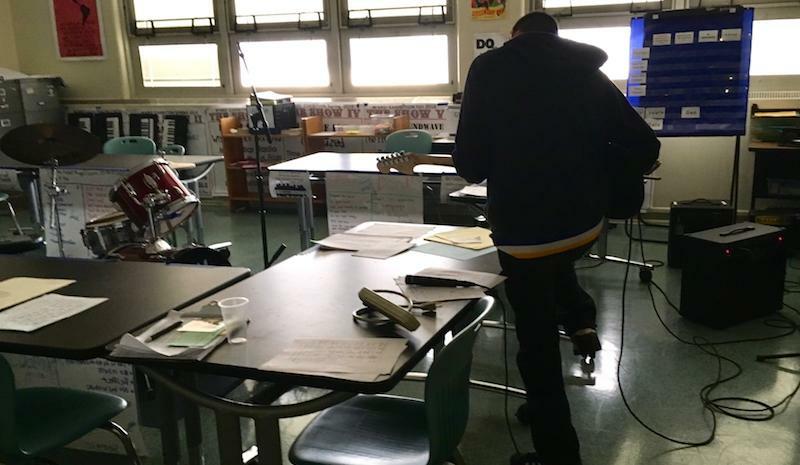 A student practices the guitar at Downtown High School, a continuation school for students 16 and older. They all take part in project-based learning. On a recent day, students at Downtown High School are giving an end-of-the-semester presentation. Downtown is a continuation school for students 16 and older, so by definition, they didn’t succeed in the district’s so-called comprehensive high schools. The school is like a microcosm of San Francisco’s black student crisis. It has a disproportionately high number of black students — and just under a third of them are in special ed. That’s compared to a fifth of the school’s non-black students. But special ed students at Downtown aren’t restricted to special classes or programs. This school’s been implementing “full inclusion” for nearly two decades — long before the district started its push. All students take part in project-based learning — one project each semester. Music, theater, wilderness. Academics are woven in. The students presenting their work today in a big multi-purpose room are in a project called GOAL for Get Out and Learn. They build boats, go backpacking, and do rope courses. This semester they’ve also dug deep into the science, politics, and literature of climate change. 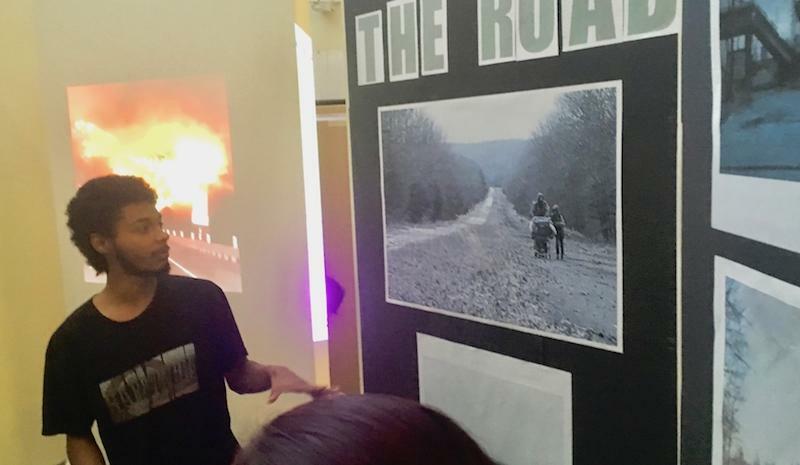 Rochean Chatman, 17, gives a presentation at Downtown High School on Cormac McCarthy's novel, The Road. Chatman said he nearly dropped out of his last high school. For years, he had been in special ed for vision and handwriting disorders that can interfere with learning. Rochean got some intensive therapy and other individualized help that he says he “loved,” but it didn’t last. When he hit 8th grade, he and his grandmother say, the district told them he no longer qualified for special ed. They placed him on what’s known as a 504 plan instead. That’s like special ed lite for students with disabilities. It can be a good thing. There’s no special ed label and students can have 504 plans in college. But Rochean says he wasn’t getting the support he needed. So while he failed out of high school, he and his grandmother waited for a new Individualized Education Program spelling out his needs and services. “The whole semester I was there I didn’t have my IEP meeting,” he says. Downtown High turned out to be a strong fit though. Rochean says he wanted the adults at school to see him, to understand him, and to help him. And Downtown High’s leaders say the school’s whole philosophy is about that. Assistant Principal Todd Williams used to work as a district special education administrator. He’s also African American. He says he knows that plenty of black students don’t get the services they need, like Rochean, and others wind up in special ed for the wrong reasons. Williams says he believes that misperception is not malicious, it’s “unconscious.” As a result, he and his team say, they have black students at Downtown High with IEPs who no longer need them, who maybe shouldn’t have ever had them. But there’s also mis-identification — students whose behavioral outbursts masked unidentified learning problems, and under-identification — often of quieter kids. Williams says his school is not afraid to refer them to special ed, despite what several school administrators told me was pressure from the district to keep numbers down, to reduce disproportionality. As for Rochean? He says he started getting the help he needed even without an IEP. Rochean Chatman, 17, says he nearly dropped out of his last high school, in part because the district had terminated his special ed status and he felt he didn't have enough support. He says Downtown High gives him the support he needs. If he hadn’t landed at Downtown, Rochean says he’s pretty sure he would have dropped out of high school. Today, he’s riffing on Cormac McCarthy. 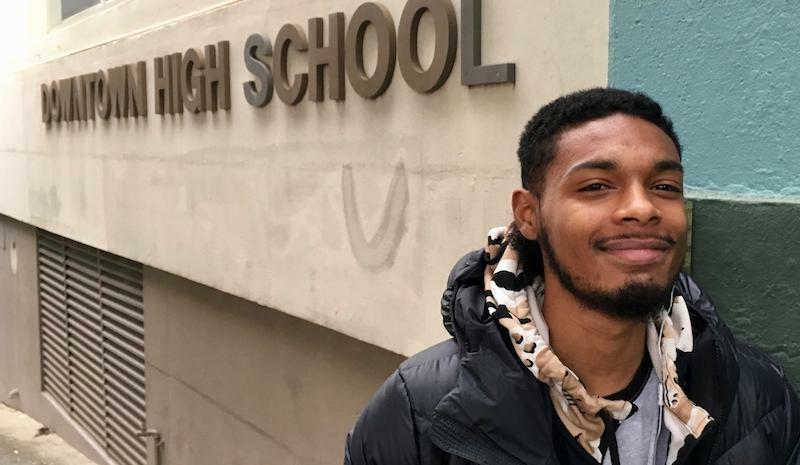 What Downtown High is doing for him, and the district is working to replicate, means kids like Rochean are much less likely to end up like Darryl Lester — Larry P., the man. Lester started school before federal law even guaranteed special ed students the right to a “free and appropriate public education” in what the law calls the “least restrictive environment.” He didn’t stand much of a chance. But in some ways, he beat the odds. He’s been clean and sober for 18 years now, he tells me, happily married for 14. He says he’s worked hard to shake the legacy of shame. All that he lost by not getting an education, though, it still causes him pain. Sometimes he says, his wife finds him sitting on the living room sofa alone at night, crying. In a crowded meeting hall in Oakland’s Preservation Park on a recent Wednesday, five teenage girls are about to receive their high school diplomas from a new program called EMERGE.